The Slovenian Clarinet Choir is the first of its kind in Slovenia ever. It was founded by the clarinetists Joze Kotar and Toni Umek, both from Trbovlje. An ensemble of this kind, however, is no novelty to the audiences abroad anymore (e.g., Piete Jeegers Clarinet Choir from Brussels and Walther Boeykens Clarinet Choir from Antwerpen, with 30 to 50 members). 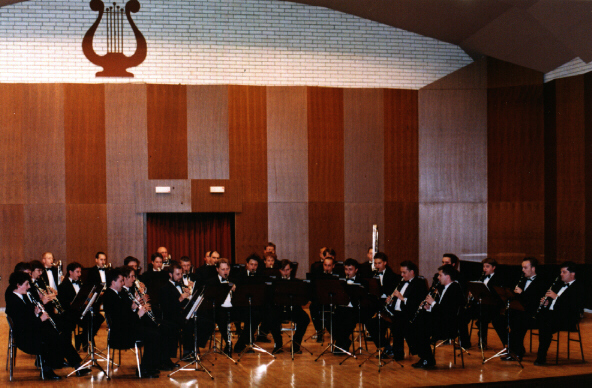 Besides woodwind and brass ensembles and choirs (such as "Phillip Jones") there are also several accordion orchestras, mandoline orchestras, and even a piano orchestra - an innovation of the Americans at the opening of the Olympic Games in Los Angeles in 1984 - which performed one of the arrangements of Gershwin's Rhapsody in Blue. As the clarinet is, besides the flute, the most popular instrument among young musicians at Slovenian music schools, secondary schools of music and the Academy of Music, the foundation of this ensemble seems to be a natural development. Its members come from the numerous excellent clarinetists of three generations, who established themselves as soloists and orchestra players in the Slovenian Philharmonic Orchestra, the RTV Symphonic Orchestra, the orchestras of the Ljubljana and Maribor Opera, the Maribor Philharmonic Orchestra, the Slovenian Police Band, the Slovenian Armed Forces Band and several quality amateur orchestras and bands, school orchestras and chamber orchestras and ensembles. Those to receive the greatest acknowledgment are mentors of all post-war generations of Slovenian clarinetists, the pioneers of contemporary clarinet playing - teachers, professors and concert performers on this orchestra instrument: Miha Gunzek, Stane Kermelj, Alojz Zupan, Slavko Goricar, Igor Karlin, Valter Petric and Marko Lednik. Slovenian conductor Marko Letonja (born 1961) is the principal conductor and artistic director of the Slovenian Philharmonic Orchestra. He began his studies as a promising pianist and completed them at the Ljubljana Academy of Music under Prof. A. Bertoncelj in 1985. At the same time Marko Letonja studied conducting under Prof. maestro A. Nanut, and further in Vienna under Prof. O. Suitner, where he graduated in 1989. He made his debut with the Slovenian Philharmonic Orchestra at the concert "Mladi mladim" in 1987 and since then he has stood in the centre of musical life in Slovenia. His further musical activities included recordings and appearances as guest conductor of the Slovenian Philharmonic Orchestra, which brought him the University Preseren Award. In 1992 he was appointed principal conductor of the Slovenian Philharmonic Orchestra and since 1995 he has also been the artistic director of the orchestra. Last modified: January 3rd, 2002.